History of Fine Portraits by Portraits, Inc. : Portraits Inc. 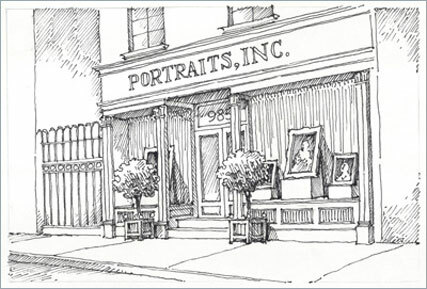 Portraits, Inc., was founded in 1942 by Lois Shaw, an art and antiques dealer and socialite. In the early 1940s,Mrs. 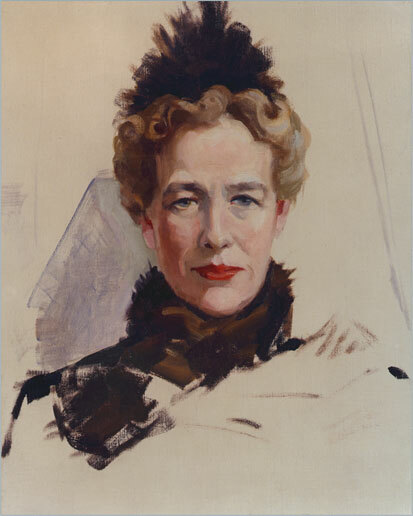 Shaw partnered with the USO to give weekly studio parties in her Park Avenue gallery that often centered on portraiture. She contacted a number of portrait artists and asked them to contribute their services by doing life drawings of the military men and women in uniform who attended the parties. These fine portraits were then nicely matted and mailed as gifts to the families of the subjects. Mrs. Shaw received a special citation for her efforts from the U.S. Government. As she was hosting these events, Mrs. Shaw quickly realized that portrait artists really had no special gallery to exhibit their work. Dedicating a room in her gallery exclusively to fine portraiture, she announced a new service called “The Portrait Painters’ Clearing House.” In 1942, she officially founded Portraits, Inc., and was soon joined by Helen Appleton Read and Andrea Ericson in her enterprise. Mrs. Shaw’s engaging personality and philanthropic spirit helped to quickly bring portraiture back in vogue in America. Shaw’s idea was a unique venture, a real innovation. Portraits, Inc., soon became the venue for a number of well-received benefit theme exhibitions, the first of which was “Portraits of Warriors,” relating to World War II, then in progress. Later exhibitions included “Family Portraits of New Yorkers” and “Portraits of Personalities,” all bridging the gap from the fine portraiture of the past to that of the contemporary field. Portraits, Inc., hosted the first Wyeth family show in the late 1940s, shortly after N.C. Wyeth’s death. A tremendous success, the show helped the Wyeth name gain prominence. A true pioneer in the exclusive representation of fine portrait artists, Portraits, Inc., firmly established its position as the world’s most esteemed portrait company in the ensuing decades. With a roster that includes virtually every major portrait painter and portrait sculptor in the world, the company’s mission from the outset has been to restore fine portraiture to its historic position in the fine arts. For more than 70 years, clientele have included the foremost names in the worlds of business, the professions, the arts, academia, and society. In 2008, Portraits, Inc., was purchased by Beverly B. McNeil and Julia G. Baughman and merged with the nationwide organization, Portrait Brokers of America. Two years later, another agency, The Portrait Source led by Ruth Reeves, joined the Portraits, Inc. name. Now with dynamic new ownership, a nationwide network of sales associates, and its continuing roster of the world’s foremost portrait painters and sculptors, there is a particularly bright future for this unique American institution. To read the article, "Consequence of Affection," click here.